Several years ago I was inspired by other Natural Parent Network volunteers and local friends to create some new family traditions celebrating winter solstice. This year the winter solstice (in the northern hemisphere) falls on December 21. While our family also celebrates Christmas, I like the history and connection to nature that the solstice provides. 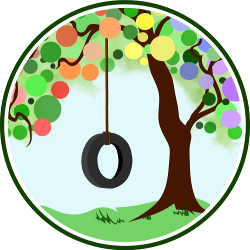 My kids love any chance to celebrate, too, and really love rituals and traditions that they can remember and look forward to each year. Since winter solstice is the shortest day — and longest night — of the year, many celebrations feature candles, lanterns and fire. In our family each of the kids makes a lantern — so far we’ve tried two different styles since we started this tradition! During the day of solstice we make our lanterns; then, as the sun sets, we gather all the candles we can find in our house and light them and our lanterns. If applicable (depending on the type of lantern we’ve made) the kids have a little parade around the house with them (perhaps this year we could do a walk around the neighborhood!). Then we light all the candles on our dining table and eat our dinner by candlelight. 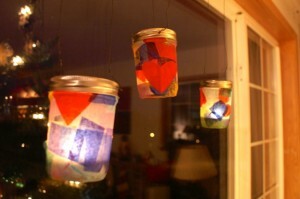 One easy, fun and beautiful “lantern” project was a tissue paper collage on glass jars. When we first did this, I just happened to have all the supplies on hand, too! I used small canning jars so we could punch a wire through the metal ring and hang ours in the window (away from curious little hands!) 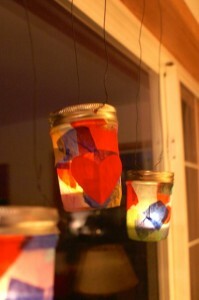 but any jar will work if you set it on a table or windowsill. Set out trays, placemats or other table coverings. 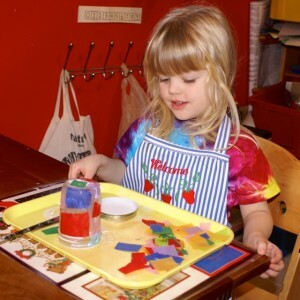 At each child’s place, set a glass jar (upside down worked best for us so glue didn’t pool inside), glue container, paintbrush and tissue paper. Paint a section of the jar with glue. 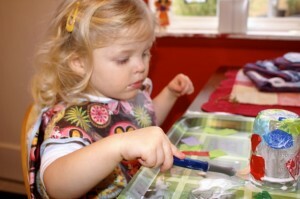 Put tissue onto anywhere wet — and paint over with more glue to help smooth down the edges of the paper. Help your child rotate the jar and point out empty spots that need filling. I also would help with smoothing out papers and painting over them when needed. My oldest found and glued on a construction paper heart at this stage to further decorate her lantern. When every space on the jar is covered (or your child feels done!) touch up if you need or want and then leave to dry for several hours. If using canning jars, you can punch holes in the ring with an awl or nail to thread wire through for hanging, or, check out this post on GardenMama for a way to use wire to hang your jar. When dry, screw ring on tightly if you wish, and set in a tea light. Light and enjoy! Before lighting our candles we have a quick fire safety discussion, then we light and have a short parade through the house holding our lanterns (by the wire hanger —if there is no hanger the jar may get too hot!). After that we hang them in a window or set on the table while we enjoy a solstice dinner by candlelight. A neighborhood walk after sunset with our lanterns would be a fun (though perhaps chilly!) tradition we may try this year, in hopes of creating more of a connection to nature on this day! Does your family celebrate winter solstice? What rituals or traditions do you enjoy?